This highly advanced system will stimulate rapid formation of flower and fruits on your vegetation in as little as 3 to 4 days due to a rapid release of potassium and phosphorus.Top Booster contains red iron (EDDHA-Fe) which will help keep your crop lush and green during the drought period. Potassium helps with transfer and absorption of nutrients. Phosphors aids in root formation as well as photosynthesis. It also assists in producing the sugars, starches and oils necessary for optimum growth. Combined, potassium and phosphorus assist in disease prevention while boosting root development. With just one application, this amazing system will help your plants transform in good health from early to late bloom. Top Booster is geared to ceasing upward growth, rather sending the energy toward the growth of healthy flowers and fruits. 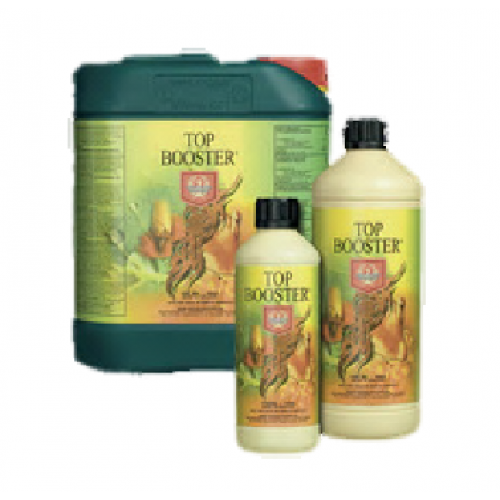 When used along with other House and Garden products, Top Booster will yield a healthy and bountiful crop. Directions for use: It is best to use Top Booster for 3-4 four weeks before harvest. Prepare your nutrient container as per usual and add the base nutrient. Next adjust the EC levels and then add Top Booster after about 15 minutes. Make sure to adjust your pH levels as well.